Dance groups, artists, canoe paddlers and traditional food experts are gearing up for Celebration 2018. 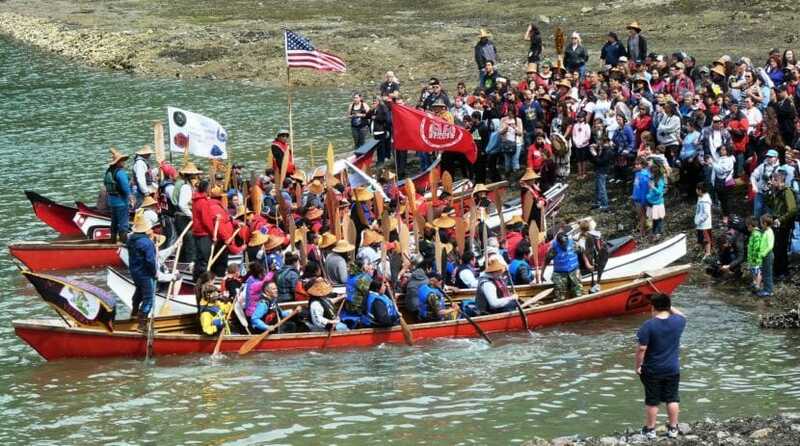 It’s Southeast Alaska’s largest Native cultural gathering, held June 6-9 at Centennial Hall and nearby sites in Alaska’s capital city. It’s been happening every other year since 1982. It can be hard to fully describe Celebration. You can talk about its expected 2,000 or so dancers and 5,000 participants. Or the language, the oral traditions and the regalia. But that just doesn’t fully capture the experience. Rosita Worl, president of the Sealaska Heritage Institute, describes one year’s grand exit, when all the groups danced out of the performance hall. “And it was like we were one people, one being, and we were all dancing. And it reminded me of a swarm of fish coming in. But everybody was kind of in unison, it was like we were part of a whole spiritual essence,” she said. Every Celebration has a lead dance group representing a clan. But this year it has two: The Shangukeidí, or the Thunderbirds, and the Lukaax.ádi, or the Sockeye. They’re from Haines and Klukwan, or the Chilkat and Chilkoot areas. Worl said they will dance together, with clan songs from each. Celebration Coordinator Carmaleeda Estrada said she’s enjoyed the growth of the youth groups. She said two younger cousins from Angoon formed their own dance troupe and will be part of their second Celebration this year. “We would never have thought to start our own dance group. So to be able to see people even younger than me taking that initiative, we have young girls in our group who are still in elementary school and they’re writing songs, they’re writing Tlingit songs. And so, just to see that from my own community is really inspirational. It really raises the bar,” she said. Regalia, from clan hats to vests to button blankets, is worn by most dancers. But Worl said that’s changing. “Before we would only allow traditional regalia. But we kept saying, if our culture’s going to evolve, then we have to let it and support that. So now you’re seeing a lot more Native fashion wear,” she said. This year’s Celebration will continue the relatively new tradition of a runway-style fashion show. For the first time, the models will have a formal model training session. “We would do that off to the side in the elders’ room and it wasn’t as prominent as it’s going to be this year. So not only are we adding the seal oil competition to that, so now there’s three food categories, but we’re also moving that to the main stage,” she said. But the action isn’t all on stage. Estrada thinks back to Celebrations she attending as a child. Editor’s note: Sealaska Heritage Institute contracts with CoastAlaska station KTOO to film and broadcast the event.